Salem is a city located in the territory of Oregon. The city of Salem is the capital of Oregon and the administrative center of Marion County. The city is located in the valley of Willamette. Salem is located along the river Willamette. The population is 154 000 people. The city of Salem was founded in 1842. In 1851 the city became the capital of Oregon. In Salem are found the Willamette University and other prestigious schools. In ancient times, on the territory where today the town of Salem is located, lived tribes. They called this area Chekemeta, which in their language meant, a place for meetings and recreation. The Methodist Mission, which was founded in this place was called Chekemeta. Ancient Indian tribes inhabited the valley Willamette ten thousand years ago. They gathered in the area that today is the city of Salem. Indians were subsisting on fishing and gathering fruits and sweet roots. In 1850 the Indians were moved from this area by the government, to Indian reservations. The first Europeans who arrived in Salem, ended up in the area in 1812. They were hunters who collected furs to sell in Astoria, Oregon. It is unclear exactly who has chosen the name of Salem city. It is, however, named after Salem, Massachusetts. Many residents of the city insisted to get back the Chekemeta name, but this was not accepted by the general mass of people. The name Salem comes from the Semitic word for sausage, and the Jewish shalom which means peace. In 1851 Salem became the Capital of Oregon. In 1857 Salem was officially recognized as a city. 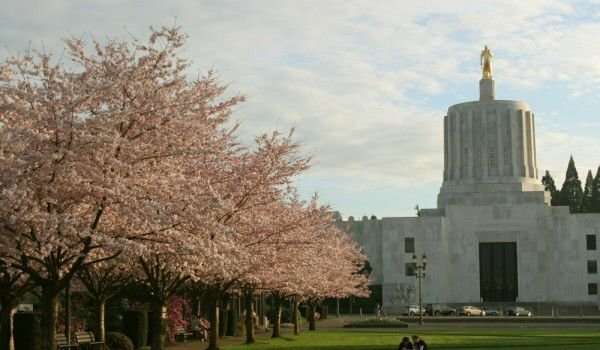 Oregon has had three Capitol buildings in the town of Salem. The third, the present Capitol building, was completed in 1938. The dome has an exalted statue of a pioneer, which is covered with gold and was named the Pioneer of Oregon. Salem grew as an agricultural town. In 1861 the town of Salem was chosen as the place for the Oregon Fair to be held annually. One of the nicknames of the city is cherry city, because its economy depends largely on the production of cherries. The first cherry festival was held in Salem in 1903. During the festival is elected a Queen of cherries. In the nineties of the twentieth century, Salem became a center of attraction for many companies engaged in production of high-tech goods. One of the largest employers in the city of Salem is the Salem hospital, which employs over two thousand seven hundred employees. Among the major employer is the university is Willamette. In Salem is located the most stringent Oregon prison.